The week-end was abuzz with speculation of Yahoo!’s intention to reject the $US45 billion bid by Microsoft to take over the struggling internet landmark. Interpretation: “Microsoft, go put your offer where the sun doesn’t shine. You just spent a fortune and outbid us for Facebook, a newcomer that is nowhere close to the YAHOO! brand presence…we are still the leader in the Asian online ad market. Do you have any idea how much we spent over the past two years on developing Panama, our brilliant advertising technology we are so certain will maximize our ad services? Yes, our stocks are not hot but our bed is still warm. But is Yahoo! in a position to play hardball? Who really needs whom? Does Yahoo! need Microsoft or does Microsoft need Yahoo!? It seems Yahoo! continues to invest its faith in Panama. The company vouches for the potential of this, their last card to preserve shareholder loyalty, but the promised results are, perhaps lost in the canal, as Panama is yet to emerge with the growth in advertising dollars and market share. After a substantial generation of funds into developing the digital platform, Yahoo! still remains number two – and a distant one at that – with just over 20% of the internet’s advertising spend. Google, on the other hand, is cruising at almost 75%. This gap is widening on a daily basis by virtue of Google’s alliances and strategic additions to its friends list. The search engine leader forges judicious relationships with software developers and technology nerds to strengthen its position globally. The most recent genius collaboration is seen in its formation of the open social network that has MySpace, Bebo, LinkedIn and others on the bandwagon. Something, even its final hours, Yahoo! still fails to achieve. Yahoo! has not delivered anything worthwhile in the better half of its thirteen years in Silicon Valley. On the tech calendar, that is a lifetime. It is widely written that a partnership with Google will increase Yahoo!’s revenues to 25%, in the form of outsourcing search. That is good, but not great. Yahoo!’s shareholders will not take kindly to a rejection of a 62% premium on their shares in exchange for $252 million increase in one area of the operation. Jerry Yang, Yahoo!’s CEO, knows better. His shareholders are unhappy and the last thing the Standford alumna needs is a class action suit for failure to fulfill his fiduciary responsibilities. Yang’s brainchild is now a hungry fish who is contemplating biting the bait dangling before him. However, the fish will only get hungrier and the bait is not in a hurry. It is not a matter of “if” Yahoo will bite, but a question of “when.” The former internet darling seems bent on playing the shy maiden in waiting to see who will come courting. It is very doubtful another suitor will offer a diamond as shiny as the one Microsoft presented last week. News Corporation, a likely contender, announces it will not enter the game. Other media companies that would benefit from this marriage, like COMCAST and Time Warner, are not interested either. The latter is not currently in a position to bid – itself locked in a failing marriage seeking divorce from AOL. Google, which received the green-light from the Federal Trade Commission to acquire DoubleClick, cannot buy Yahoo! for anticompetitive reasons. Therefore, Microsoft is the only enterprise with the balance sheet that is able to support such a union. While this union is a matter of survival for the crumbling Yahoo! stocks, for the world’s top software architect, this is a hypergamous marriage and a matter of competition. Microsoft’s CEO and CFO, Ballmer and Liddell, are simply flexing their business savvy to make their mark. Microsoft is a software company, not an internet innovator and it has not in its 32 years, proven otherwise. The boss of the IT world has always played catch-up with the internet forward thinkers and buys what it cannot create. If Microsoft is, in fact, the grinch from Redmond who desires to steal the dogma of openness and creative juices upon which the Silicon Valley fraternity is built, then Ballmer’s next move is obvious. 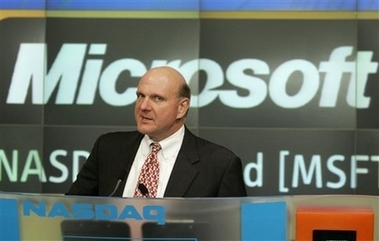 A skilled and competitive business barracuda, Ballmer does not want to go down like Carly in the HP-Compaq merger. He seems to be more like a Rupert Murdock in the Dow Jones purchase. And Steve “nah gyow.” The CEO already intimated in his proposal letter that come March at the next Yahoo! board election, he may oust the members from their seats, of course, in the interest of shareholders. If Microsoft is the monopolistic bully critics say it is, then instead of presenting a new deal to Yang and the Yahoo! board, the world should expect that it will make Adam Smith proud and refuse to raise its bid, wait for Yahoo! to plummet further – and it will, then buy it out at $8 per share. Such is the principle of a ‘free’ market capitalism. The winner takes all.